Sometimes a child with a disability needs help to eat. Sometimes the effort of chewing and swallowing requires more strength or coordination than the child possesses. Without intervention, a child may rapidly lose weight and be unable to fight off an infection or a virus. Good nutrition is essential for good health. When the problem is seen to be a temporary one (a crisis brought on by an acute illness like pneumonia), a naso-gastric tube may be the best solution. This is a very thin tube which is inserted through the nose directly into the stomach. A liquid feed is then run through the tube by fitting a syringe into the top end and pouring the feed down – a feed can be plain milk, a commercial preparation (expensive! One feed costs approximately 50 rupees) or a homemade formula. Putting the tube in is an awkward procedure, which even a cooperative person – one who understands the necessity and has agreed to it – instinctively fights against. The gag reflex is highly developed and most people find the insertion of the tube very unpleasant. When the person is a child, particularly if the child has a mental handicap and cannot understand what is happening, several people may be required to hold him down. The process takes less than a minute when an experienced doctor is doing it, however, so the suffering is minimal. It is upsetting, but remind yourself that it will save your child’s life. A Naso-gastric tube is, by nature, a temporary solution to a crisis. It is designed to be used for only a few weeks (and even during that time, the tube must be switched from one nostril to the other periodically – otherwise, the nostril itself begins to be cut into by the constant pressure of the tube) – that said, there are people who have continued on it for months. While doctors often treat the decision matter-of-factly, as the only logical step to take in a crisis, it is important for parents to be prepared for the emotional toll the decision to tube feed brings. There is something final-feeling about a tube to provide nourishment, as if an important milestone has been crossed. Parents often break down in tears after the procedure is over and may need much reassurance from friends and family. The child, of course, will also need tremendous emotional support. Once the tube is in and the child is settled, however, the benefits almost immediately become apparent. With proper nourishment, the child’s natural healing abilities suddenly kick in and she begins to get better. It is almost miraculous to watch a child who had been hovering on the brink of starvation make the turn back to life and good health. Another advantage of the tube is that you can administer medicines through it too. Try to stick to liquid meds. Crushed pills often clog the tube and contribute to its breakdown more rapidly than liquids. If pills are all you have available, try to soak them in water till they are completely dissolved. Overnight usually works well. Putting in a G-tube is a momentous decision for most parents. A naso-gastric tube, while difficult to decide upon, is still temporary and there are many children who have needed one once or twice and then returned to normal eating. 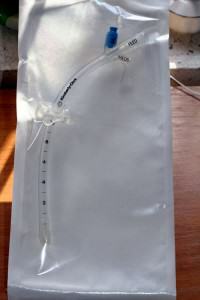 But a G-tube, while also reversible, is seen as a more permanent decision. The whole landscape changes. The social act of sharing food is so central to our human existence that to be nourished in any other way seems alien and bizarre. A G-tube involves making a surgical opening in the abdomen and threading the tube through. It is held in place by a small balloon like protrusion which is inflated from the outside. The method of choice is to put the tube in via endoscopy – which means that the tube goes through the mouth, down the esophagus and out through the opening the surgeon has made in the abdomen. The old method was to make a much larger opening in the abdomen and put the tube in from there. This new approach minimizes the extent of the incision and promotes faster healing and less of a scar. In India, most [content_tooltip id=”11093″] are around a foot long and trail from the abdomen. The outside end has a little stopper, which you open when it is time for a feed. You push a tiny funnel (available in medical supply or laboratory equipment shops) into the opening and pour the feed down. Take your time while pouring. You don’t want to overload the tummy by shoving it all in at one go. Sometimes, when the tube is opened first thing in the morning, some gastric fluids may spurt out. The same thing will happen if the child coughs or laughs during a feed. You can pinch the tube when this happens to avoid having everything come right out. Sometimes the tube may get clogged. Flush it gently with a syringe of warm water. The best size is 50ml, but this can be difficult to find in India. If you do locate a shop that stocks them, buy several to have on hand. A commercial formula (Ensure) is simple to prepare and easy for many people to digest. It is, however, very expensive at Rs 350 per tin (seven feeds). Be careful about making sure the stopper on the tube stays closed. The gastric juices the stomach produces to break down food are like acid and burn when in contact with the skin. My daughter managed to open her tube one night and when I got her up in the morning she was drenched in the highly corrosive fluid and her skin was burnt in several places. Because she has an abnormally high pain threshold, she didn’t cry and I have no idea how long she was in this condition. The scars are still on her body however. We now cover the top of the tube with a small pouch which we tie in a tight knot before she goes to sleep at night. She is unable to remove it and cannot accidentally open the tube again.